Mexican and Afghani cannabis strains have a good reputation among growers and users, so it wouldn’t be farfetched to claim that, in the hand of the right grower, the two could produce something wonderful. And in the case of California Dream, they did indeed – a powerful, very potent plant, with great looks, great taste, and great high. There’s not a single down side with California Dream, it scores 10s across the board, with a consistency that’s not readily seen in the world of cannabis growing. California Dream is a cannabis strain that produces plenty of lateral branches with a lot of leaves which look like typical Indica leaves, wide and rounded, which all together give California Dream a shape of a smaller Christmas tree. The buds are conical in shape, light green with fine white hairs, and an amount of resin that would leave anyone breathless. 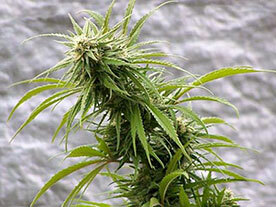 Overall, the plant looks like a strong, high-producing plant, which it certainly is. Saying that California Dream’s taste is complex would be correct – users experience a slightly minty, skunky flavor, with herbal and sweet fruity undertones. 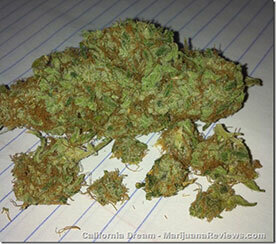 And when using California Dream, people have a very short time to think about taste before the fast hitting effects starts to show – a complete body relaxation with a moderate euphoric feeling, the type of cannabis effects that make you feel like you can go out and be very sociable, or stay at home and just relax and enjoy the very pleasant feeling. These effects are also significantly long-lasting, and with a THC count that goes as high as 24%, it’s easy to understand why. Afghani genes can be seen from California Dream’s general resistance to mold and stress, but they also contribute to the plant’s overall susceptibility to nute burn, which is why special care should be taken to watch out for too much nitrogen in the fertilizer mix and soil. This cannabis strain grows best on soil, and if you really want to grow it right, you should use 400-600W HPS per m2 in the vegetative state. Sea of Green is a viable option for growing California Dream, but in that case, the grower would be advised to prune some of the lower branches in order to strengthen the ones higher up. California Dream is a popular cannabis strain, and finding California Dream seeds to buy online shouldn’t have to be very difficult. Checking out a few different online shops will ensure you get the best deal and buy the cheapest California Dream seeds on the market.